Up guard X2 and Up forward X4 trap. If there is also a player in the corner X5 will move to the cut off the passing lane while X3 will front the post. X1 will take away any pass to the high post and be alert to deflecting or stealing the pass back to the top. X1 will gamble on this pass if it is made across his position. The straight back pass to the top is the only pass we will give up without a challenge. Up Forward X4 and Middle X5 trap. Middle X5 and Up forward X4 trap. 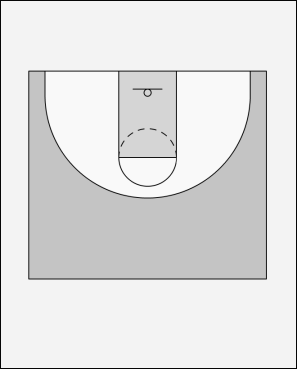 X2 will split the passing lane between the wing and corner reading the offense looking for the steal or deflection. Up Guard X2 and Wide Guard X1 trap. Up Forward will move toward the lane and be alert for anyone flashing or cutting into the lane. X4 will jump any flash or cut into the lane and play it m2m.